Unified Vision tells the story of the Prairie School through the collection of The Minneapolis Institute of Arts, which includes a large group of furniture and other objects from Prairie School structures in Minnesota, Illinois, and Iowa. 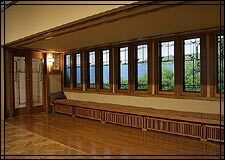 Featured architects include William Gray Purcell, George Grant Elmslie, Frank Lloyd Wright, and George Washington Maher. In addition, the collection includes an important Prairie School home, the Purcell-Cutts house, designed in 1913 by Purcell and Elmslie. This program offers a closer look at the Institute's objects and those who designed them, as well as an extensive tour of the Purcell-Cutts house. A related component is an architectural tour highlighting major Prairie School structures in Minnesota, which can be taken online or as an actual tour. The focus of this tour is the work of Purcell and Elmslie, whose buildings are concentrated in the Minnesota area. Both the collection section and the architectural tours feature numerous historic photos, drawings, and architectural plans. To get started, click on a selection above. This book is an essential guide to Prairie School art and architectureâ€”and served as the basis for this Web project. With its multitude of historic photographs, many never before published, Progressive Design in the Midwest is a unique combination of history, house tour, and museum guide. Available in the online Museum Shop or in the Museum Shop at The Minneapolis Institute of Arts.